When you read political accounts of India between the First and Second World Wars, it is turmoil and agitation that are at the forefront of their stories. Such accounts stress constant campaigns of civil disobedience, all with the aim of gaining independence or Home Rule for India. When you read regimental histories of the same period, however, you fifnd no record of any disturbance affecting the country. Instead their pages are full of sporting success – the cavalry at polo, for instance – or of promotions or retirements, of military pageants and the presentation of new colours. 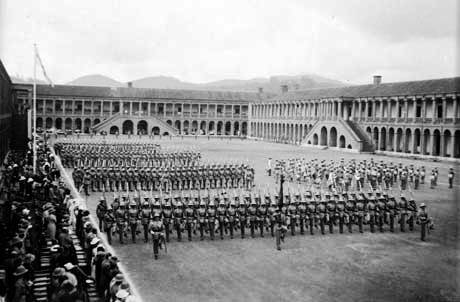 Parade at Wellington Barracks, Southern India , mid 1930s. 1st Batallion King’s Own Royal Regiment. Perhaps the truth lies somewhere in between. In the inter-war years the British in India were well aware of opposition to their rule, but the sense of strain was intermittent. Large areas of apparent calm remained, evidenced in the stream of parades, race weeks and polo tournaments. But beneath that calm surface existed deep undercurrents, and all were flowing in the same direction. 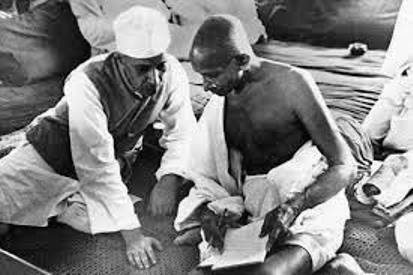 At the end of 1928 the Indian Congress had put the British government on notice that it would launch all-out civil disobedience unless India was granted internal self-government. During the next decade, the wheels of constitutional political reform begun to turn at some speed and by 1935 the provinces had been given some measure of self-government. Thirty-six million people India-wide were allowed to vote. This political reform together with the steady Indianisation of the Indian Civil Service helped to weaken the Raj’s grip. Indians as a whole, though, never really believed that Britain had any intention of handing over power; they thought the British would find some trick to avoid it. Lieutenant Rana in The Girl from Cobb Street is certain of it, and that conviction leads him to take extreme action. And in Congress, politicians were adamant that a Britain that abused India, gave them a cause for ejecting the British from their country and treating those Britons who had served loyally and fairly as hindrances to Home Rule. After the 1935 Government of India Act, most people in Britain realised independence would come, but what they did not realise was that it would come so soon. There was widespread antipathy among Britons towards Indian politicians. 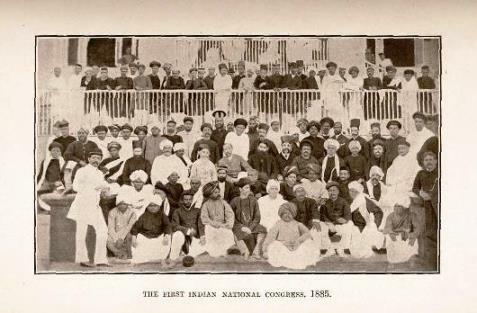 ‘The Congress wallahs’ were seen as being of poor calibre, and dubious in their methods to gain independence. 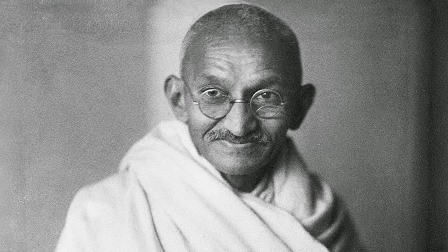 Gandhi himself was viewed as slightly absurd and the Non-Cooperation Movement he founded as a bit of a nuisance. Yet its campaigns of non-cooperation and civil disobedience were to grow in strength and frequency during the whole of the 1930s. Plenty of other groups were campaigning for independence and were gathering momentum. Many Indians turned to nationalism after suffering personal loss and humiliation as a result of official discrimination, and the frustrated careerist was a common figure. But though official discrimination might have got them started, the belief in national self-determination was a powerful one and drove them on. 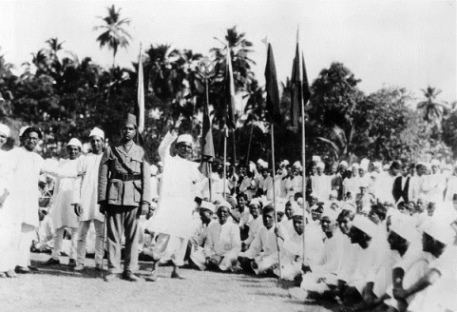 Civil disobedience meeting, Bombay, 1930. Different groups saw different prizes in independence. Militant Hindus were attracted to Hahasabha groups which promised to defend and purify their faith. Expanding trade unions spoke not only for industrial workers but for the rural peasantry, who joined associations concerned with rent, tenure and tax. (The British Raj in the form of Gerald Mortimer in The Girl from Cobb Street, dismisses the Gandhi effect as unimportant but peasants in revolt are seen as far more disturbing). Together it added up to a credible and effective movement of nationalist resistance, at the same time as the Raj was shedding more and more of its power. 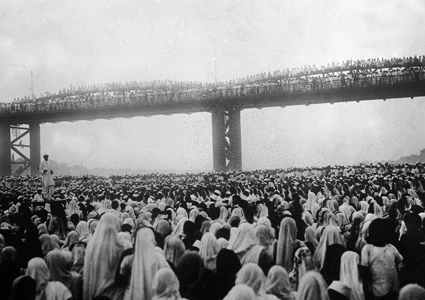 Demonstration against British rule in India, 1930s. Most resistance was peaceful and political demonstrations were based on Gandhi’s concept of passive resistance. Sometimes large mobs would converge on a market place waving flags and banners and shouting slogans in support of Mother India. It was most often sufficient for the British police superintendent to appear in full uniform with a revolver on either side of him. A constable would take away banners and flags together with the leaders of the demonstration. The superintendent would threaten anyone who remained and tell them to go home, or else. 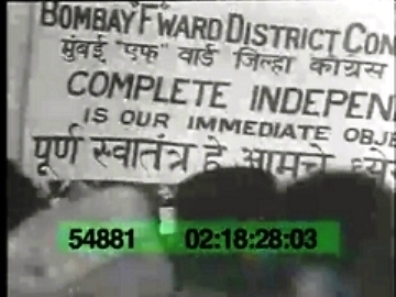 A Congress banner, written in English and Hindi, advocating independence. It usually worked, but if not, the force available to the Raj was sufficient to handle virtually any disturbance. If a riot did develop, the police never lost control of the streets or countryside for long. Generally, it was bricks and soda water bottles hurled against their clubs and sticks. Rioters who refused to disperse on police orders were greeted with lathi charges, and if it looked as though things were getting completely out of hand, the crowd would be met with a police volley. Local organisers were arrested and imprisoned as an example. Those considered guilty of peddling ‘sedition’ were deported to Burma or the Andeman islands and in extreme cases, ‘terrorists’ were executed. Many Indians might have wanted to stand up to the Raj, but few were prepared to face the dire consequences of breaking the law. The police were not alone in their defence of the status quo. The Empire was defended by a very large well-equipped professional army (see The Indian Army), which could be reinforced by regiments from the British regular army if necessary. Only when the police could not contain the crowd were the military called in. The army was the weapon of last resort and so used infrequently. When they were, the consequences could be terrible. The most infamous incident occurred in April, 1919 at Amritsar when 379 people were massacred and over one thousand wounded at what had been a peaceful political meeting. 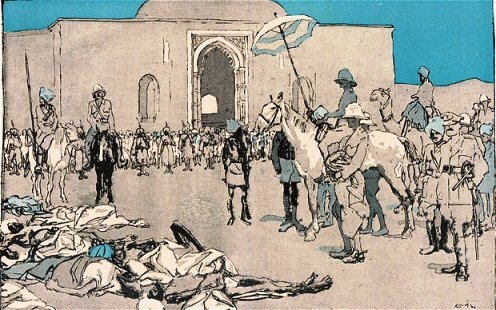 An artist’s view of the Amritsar massacre. The army did not like coming to the aid of the civil power. They preferred to be fighting a known enemy and, after the Amritsar massacre, it was unusual for them to open fire. Instead, when the crowd grew angry and unruly and began pressing up against the soldiers, they dropped the butts of their rifles on bare toes and this eventually moved the crowd back. This is Daisy’s experience in The Girl from Cobb Street when she and her friend, Jocelyn Forester, become unintentionally caught up in the Jasirapur riot. As the Thirties neared their end, no one could fail to see the danger of war in Europe. A strange sense of timelessness still gripped the British in India, but radical change was on its way. In the Indian Army, for instance, the cavalry said goodbye to its horses and learned to drive light tanks. It was clear that Britain was entering a new world and one in which India would almost certainly become independent. The outbreak of war in 1939 marked the beginning of the end of Britain in India. Ghandi and Nehru – the Indian National Congress hunts for a way to create a national identity.